Each month I post the real estate market conditions for Timbercreek and many other popular neighborhoods in Spanish Fort. Well, the stats are in for September 2018! Knowing the numbers should help you in your decision whether you are buying or selling a home in Timbercreek. As you can see, there are 38 homes that are for sale here but remember, Timbercreek is a very large neighborhood so seeing this amount of properties on the market shouldn’t scare you off. This amount represents about 5% of the total number of homes in the neighborhood. Timbercreek offers many different styles and sizes of homes. For instance, the largest home that is for sale (as of this writing) has 6,823 square feet and the smallest has 1,818 square feet. The highest priced home is $684,900 and the lowest priced is $239,900. This information for Sold Homes was taken from the activity of the last 60 Days. Timbercreek continues to attract buyers on a monthly basis and the numbers show with 8 homes closing in the past couple of months. The largest home had 3,575 square and sold for $437,500. The smallest home offered 1,444 square feet and sold for $185,000. You see, there really is something for everyone in this beautiful community. For the 8 homes that sold, the average price per square foot was $125 with a 97% listing to selling price ratio. This tells us that Timbercreek is still in a slight buyer’s market. For more information and to see all of the homes that are currently for sale in Timbercreek, please visit this page. 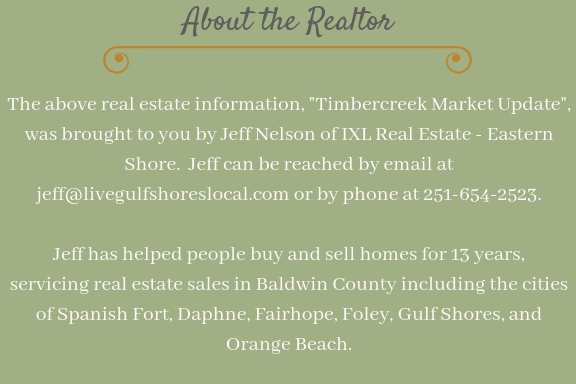 If you’re a buyer or seller for Timbercreek of Spanish Fort, please reach out to me from the information below. Let’s talk!